Easy Homemade Meatballs and Spaghetti! I love cookbooks. I read them like novels. Even the recipes that I would never make…too complicated, or with ingredients that no one in my family eats. It’s like a treasure hunt….every once in awhile I find a great recipe. But I must admit, having my laptop in the kitchen has reduced the time I used to spend perusing the books. I can do a search and find an infinite number of interesting recipes. Some I make once, and although they were good, I don’t make them again. Usually because it wrecks the kitchen, takes too many pots and pans, or exotic ingredients that I don’t keep on hand. But today I needed to make something to take to a couple from church who just had a baby. When I cook for people from church I usually try to make something that can be reheated or frozen, and also that I can make extra for my family. I found a recipe that I think will be a keeper. Homemade meatballs are usually so messy…you have to mix them, shape them, bake them, and then you also have to make a sauce. These were so easy, and because they simmer in the same pan as the sauce, they make jarred sauce taste homemade. You could use homemade sauce if you wanted, but I put these together in about 15 minutes before lunch, and let them simmer for a couple of hours while I cleaned up the kitchen. 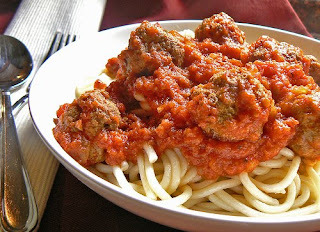 Boil up some spaghetti, and voila, delicious spaghetti and meatballs with almost no mess! This recipe made enough for my family, the family from church, and I had enough left over to freeze for another day. You could halve the recipe if you don’t need as much. 1. 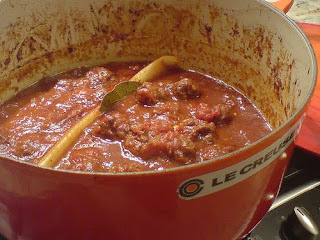 Place sauce and tomatoes in large saucepan and simmer over medium heat. 2. In large bowl mix beef, eggs, crumbs, parsley, garlic, salt and parmesan. 3. Mix together with hands, and shape into meatballs. (I made about 1.5 ” thick meatballs and it made about 36). 4. Place meatballs in simmering sauce. 5. When sauce returns to a simmer, cover and cook 45 minutes to an hour until cooked through. I simmered the sauce and meatballs for about 2 1/2 hours to make sure they were completely cooked. 6. Serve sauce and meatballs over warm spaghetti. They were a huge hit with J, and the kitchen still smells incredible after the sauce simmered all afternoon!